PerioSciences products, such as AO Pro Rinse, AO Pro Toothpaste and PerioSciences AO Advantage gel are getting increasing recognition in dental offices across the US for the powerful benefits they can bring. These products are not sold in stores and are only available from in dental offices that provide the PerioSciences products. Here at Accent Smile Center in Dickson, TN Dr. Ford Gatgens and his team of dental assistants and oral hygienists want you to have a healthy and gorgeous smile. PerioSciences products are antioxidant infused and can have many significant advantages. What Can PerioSciences Antioxidant Products do for Your Smile? Antioxidant-rich oral products can neutralize free radicals in your mouth. The main threat comes from the damage they can do when they react with DNA, or the cell membrane. Cells may function poorly or die if this occurs. To prevent free radical damage the body has a defense system of antioxidants. Antioxidants can interact with free radicals and terminate the breakdown before vital molecules are damaged. The main micronutrient (vitamin) antioxidants are vitamin E, beta-carotene, and vitamin C. Those free radicals could put significant oxidative stress on your mouth that could be destroying your teeth and gums, as well as causing bacteria which results in bad breath. 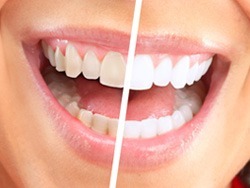 If left untreated, the bacteria will lead to or accelerate the progress of gum disease.In addition to antioxidant products helping foster a healthier environment in your mouth, PerioSciences products are available in gel, rinse formula and toothpaste to help you with a variety of oral concerns, including sensitive teeth, dry mouth, and teeth whitening. Dickson, TN dental offices are also seeing an increase in requests for natural toothpastes without potentially harmful chemicals in them and PerioSciences natural toothpastes, rinses, and oral gels boost the health and freshness of your mouth as well as contain safer ingredients to aid with sensitivity, whitening, and general oral health. Talk to us today about your oral health concerns and we would be happy to help you find out about products or procedures that will help. PerioSciences products are not sold in stores but are available at Accent Smile Center. Dr. Ford Gatgens and his team care about you and your smile, striving to provide a comfortable dental office with the latest in modern dental technology and proven products that help you achieve a healthy, functional, and beautiful smile. Make an appointment to talk to us about your needs, whether you want general dentistry, are interested in cosmetic dentistry procedures to improve your smile, or need help with restorations, oral surgery, or another smile-related issues. Book an appointment at Accent Smile Center by calling us at (615) 492-3881.